“Hello. Is this The Explorers Club? It is. Well, Brian Wilson called and was wondering if he could have his sound back. Thanks!” Click. 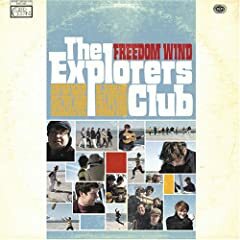 The Explorers Club take the words “influence” and “similarities” to whole new heights with their album Freedom Wind—essentially a Beach Boys tribute album, albeit with original lyrics. There are a few tracks that barrow from other 1960s bands—The Beatles spring out at times—but ultimately, the harmonies, arrangements and lyrical themes that anchor this puppy are straight Wilson. This is not necessarily a bad thing, since The E Club have taken their “recreation” (See also: homage, regeneration, impersonation, etc.) seriously, and produced a very listenable, upbeat, summery record. Nevertheless, this could be hit or miss for serious Beach Boys fanatics, for some may see this as a degradation of sacred sound; however, for someone looking for some care-free, 60s style pop, there’s no reason why this album shouldn’t be enjoyed. I instantly loved "Last Kiss" after Larson recommended that I check out this band that reminded him of the surf bands like the Trade Winds and the Sunrays. It's a great single. It could be a lost track accidentally left of Rhino's surf music box set. However, those were all singles bands. Surf music was a singles genre. I wonder if these guys would have been better served if they had just decided to release a couple more killer singles before compiling them with some filler. Oh, and the Trade Winds "New York Is A Lonely Town" and the Sunrays "I Live For The Sun" are both AWESOME. damn! i forgot all about "New York Is A Lonely Town".. that song rules.. I'm pretty much afraid to listen to this album for the reasons Jesse stated. Well, lucky for you guys I recommended 3 good tracks—"Forever,” “Don’t Forget The Sun” and "Last Kiss"—which are all jolly surf pop tracks. I'd say only two of the songs off the album serve as filler (meaning they just don't seem to belong; "Honey I don't Know Why" is one of those tracks) the rest of it remains true to formula and is pretty good... So, don't be scurrrd. Sounds better than the latest Weezer disaster ;) Can't wait to check it out. Definitely my most favorite CD purchase in the last year! Fun, fun, fun sound and the tunes stay with you. Harmonies are awesome - bring back those good ole days! Keep it up, Explorers Club! Everyone needs a copy before they hit the beach or the road this summer. Word up! See, I'm not completely crazy.